The most devastating consequence of the spread of American culture across the globe has not been our golden arches or our bomb craters, but our bulldozing of the human psyche itself. American-style depression, post-traumatic stress disorder, and anorexia have begun to spread around the world like contagions, and the virus is us. Traveling from Hong Kong to Sri Lanka to Zanzibar to Japan, acclaimed journalist Ethan Watters witnesses firsthand how Western healers often steamroll indigenous expressions of mental health and madness and replace them with our own. 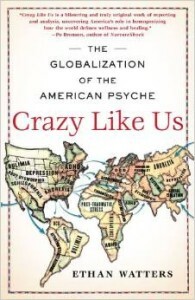 In teaching the rest of the world to think like us, we have been homogenizing the way the world goes mad.